If your so-called "good" cholesterol is up, you don't have to worry about that so-called "bad" cholesterol. We got permission from Dr Uffe Ravnskov, M.D., Ph.D to reprint the entire first edition of his book entitled The Cholesterol Myths. It is well researched, well documented, and very thorough. However, because of space considerations and information recently received, we have decided to print only the highlights of his research. You can find his first edition on the web at The Cholesterol Myths or you can order his new book from there..
As we were writing this article/chapter, we found these headlines: Expert Panel on Detection, Evaluation, and Treatment of High Blood Cholesterol in Adults. The brunt of the article came down to this: they have now redefined their lipid standards in such a way that one out of five healthy Americans is suddenly a patient [JAMA Vol. 285 No. 19, May 16, 2001]. In the May 16 issue of the Journal of the American Medical Association an expert panel from the National Cholesterol Education Program has published new guidelines for “the detection, evaluation, and treatment of high blood cholesterol.” Their writing seems to be an attempt to put most of mankind on cholesterol-lowering diets and drugs. To do that, they have increased the number of risk factors that demands preventive measures, and expanded the limits for the previous ones. But not only does the panel exaggerate the risk of coronary disease and the relevance of high cholesterol, it also ignores a wealth of contradictory evidence. The panel statements reveal that its members have little clinical experience and lack basic knowledge of the medical literature, or worse, they ignore or misquote all studies that are contrary to their view. Here come a few examples of the panel’s false statements. As an argument for using cholesterol-lowering drugs the panel claims that twenty percent of patients with coronary heart disease have a new heart attack after ten years. But to reach that number any minor symptom without clinical significance is included. Most people survive even a major heart attack, many with few or no symptoms after recovery. What matters is how many die and this is much less than twenty percent. Waist circumference above 88 cm in women; above 102 in men. Test yourself and your family! I guess that most of you “suffer” from the metabolic syndrome. And this combination, says the panel, conveys a similar risk for future heart disease as for people who already have coronary heart disease. Luckily, it is not true. It is not true either, that high cholesterol is a strong, independent predictor for other individuals. In most studies of women and of patients who already have had a heart attack, high cholesterol has little predictive power, if any at all. In a large study of Canadian men high cholesterol did not predict a heart attack, not even after 12 years, and in Russia, low, not high cholesterol level, is associated with future heart attacks. Most interesting is the fact, that in some families with the highest cholesterol levels ever seen in human beings, so-called familial hypercholesterolemia, the individuals do not get a heart attack more often than ordinary people, and they live just as long. It has also escaped the panel’s attention that the effect of the new cholesterol-lowering drugs, the statins, goes beyond a lowering of cholesterol. The question is whether their cholesterol-lowering effect has any importance at all because the statins exert their effect whether cholesterol goes down a little or whether it goes down very much. No doubt, the statins lower the risk of dying from a heart attack, at least in patients who already have had one, but the size of the effect is unimpressive. In one of the experiments for instance, the CARE trial, the odds of escaping death from a heart attack in five years for a patient with manifest heart disease was 94.3 %, which improved to 95.4 % with statin treatment. For healthy people with high cholesterol the effect is even smaller. The WOSCOPS trial studied that category of people and here the figures were 98.4 % and 98.8 %, respectively. In the scientific papers and in the drug advertisements these small effects are translated to relative effect. In the mentioned WOSCOPS trial for instance, it is said that the mortality was lowered by 25 %, because the difference between a mortality of 1.6 % in the control group and 1.2 % in the treatment group is 25 %. When presented with accurate statistics on the value of statins, almost all my patients have rejected such treatment. To claim that the statins dramatically reduce a person’s risk for CHD, as was stated in the press by Claude Lenfant, the director of the National Heart, Lung and Blood Institute, is a misuse of the English language. The figures above do not take into account possible side effects of the treatment. In most animal experiments the statins, as well as most other cholesterol-lowering drugs, produce cancer, and they may do it in human beings also. In one of the statin trials there were 13 cases of breast cancer in the group treated vid pravastatin (Pravachol®), but only one case in the untreated control group, a scaring fact that is never mentioned in the advertisements or the guidelines. It is also an alarming fact that in one of the largest experiments, the EXCEL trial, total mortality after just one year’s treatment with lovastatin (Mevacor®) was significantly higher among those receiving statin treatment. Unfortunately (or happily?) the trial was stopped before further observations could be made. In human beings the effects of cancer-producing chemicals are not seen before the passage of decades. If the statins produce cancer in human beings, their small positive effect may eventually be transformed to a much larger negative one, because side effects usually appear in much higher percentages than the small positive ones noted in the trials. Whereas possible serious side effects of the statins are hypothetical, those from the previous cholesterol-lowering drugs, still recommended by the panel, are real. Taking all experiments together, mortality from heart disease after treatment with these drugs was unchanged and total mortality increased, a fact that has given researchers outside the National Cholesterol Education Program and the American Heart Association much reason for concern. The panel’s dietary recommendations represent the seventh major change since 1961. For instance, the original advice from the American Heart Association to eat as much polyunsaturated fat as possible has been reduced successively to the present “up to ten per cent”. But why this limit? Seven years ago the main author of the new guidelines, Professor Scott Grundy, suggested an upper limit of only seven per cent, because, as he argued, an excess of polyunsaturated fat is toxic to the immune system and stimulates cancer growth in experimental animals and may also provoke gallstones in human beings. These warnings have never reached the public. Furthermore, the panel ignores that a recent systematic review of all studies concerning the link between dietary fat and heart disease found no evidence that a manipulation of dietary fat has any effect on the development of atherosclerosis or cardiovascular disease—this paper won the Skrabanek Award 1998. For instance, in a large number of studies, including the incredible number of more than 150,000 individuals, none of them found the predicted pattern of dietary fats in patients with heart disease. No supportive association has been found either between the fat consumption pattern and the degree of atherosclerosis (arteriosclerosis) after death. Most important, the mortality from heart disease and from all causes was unchanged in nine trials with more radical changes of dietary fat than ever suggested by the National Cholesterol Education Program, a result that was confirmed recently in another review. To suggest that diabetic patients should obtain more than 50 percent of their caloric intake from carbohydrates seems unusually bad advice. Many carbohydrates are quickly transformed into sugar inducing rapid changes in blood sugar and insulin levels and thus stimulating a rapid conversion of blood sugar to depot fat and chronic feelings of hunger. Diabetic patients should eat more fat. Is it a coincidence that the Americans’ decreasing intake of fat during the last decade has been followed by a steady increase of their mean body weight and an epidemic increase of diabetes? Instead of preventing cardiovascular disease the new guidelines may increase the mortality of other diseases, transform healthy individuals into unhappy hypochondriacs obsessed with the chemical composition of their food and their blood, reduce the income of producers of animal fat, undermine the art of cuisine, destroy the joy of eating, and divert health care money from the sick and the poor to the rich and the healthy. The only winners are the drug and imitation food industry and the researchers that they support. Cholesterol is not a deadly poison, but a substance vital to the cells of all mammals. There are no such things as good or bad cholesterol, but mental stress, physical activity and change of body weight may influence the level of blood cholesterol. A high cholesterol [level] is not dangerous by itself, but may reflect an unhealthy condition, or it may be totally innocent. A high blood cholesterol [level] is said to promote atherosclerosis (the scientific name for arteriosclerosis) and thus also coronary heart disease. But many studies have shown that people whose blood cholesterol is low become just as arteriosclerotic as people whose cholesterol is high. Your body produces three to four times more cholesterol than you eat. The production of cholesterol increases when you eat little cholesterol and decreases when you eat much. This explains why the “prudent” diet cannot lower cholesterol more than, on average, a few percent. There is no evidence that too much animal fat and cholesterol in the diet promotes atherosclerosis or heart attacks. For instance, more than a dozen studies have shown that people who have had a heart attack haven’t eaten more fat than other people, and degree of atherosclerosis at autopsy is unrelated with the diet. The only effective way to lower cholesterol is with drugs, but neither heart mortality [nor] total mortality have been improved with drugs the effect of which is cholesterol-lowering only. On the contrary, these drugs are dangerous to your health and may shorten your life. The new cholesterol-lowering drugs, the statins, do prevent cardiovascular disease, but this is due to other mechanisms than cholesterol-lowering. Unfortunately, they also stimulate cancer in rodents. The reason why laymen, doctors and even scientists have been misled is because opposing and disagreeing results are systematically ignored or misquoted in the scientific press. Drug companies are ready to lower your cholesterol levels—for a price (and not just monetary). Reuters reported in 1998 that, “drugs that lower blood cholesterol levels may indirectly raise the risk of certain types of violent death by producing personality changes.” People who quit smoking suddenly notice a great drop in their cholesterol level. This is because the body’s (arteries’) need for cholesterol has dropped. Think about this. Smoking uses up our vitamin C making the arteries nutritionally deficient thus causing pitting. Pitting requires patching by the so-called bad cholesterol. When a smoker stops smoking, the body’s need for cholesterol goes down and s/he realizes a subsequent decrease in cholesterol levels. Artificially lowering one’s cholesterol with drugs is not the same as lowering one’s need for cholesterol. Getting proper nutrition to your cardiovascular system will lower your need for cholesterol and subsequently lower your cholesterol levels. As the good doctor points out above, the recommended dietary changes cause cholesterol levels to drop just a few percent, at the most, because the recommended dietary changes are not the dietary changes your body needs. They are artificial dietary standards created by a system that profits from your high cholesterol levels. The connection between heart disease and high cholesterol levels is not causal (high cholesterol does not cause heart disease) but rather high cholesterol can be an indicating factor that your arteries are undernourished and need repairing. We did the secondary research, Dr Rath did the original research, and both of us have concluded the same thing. Dr Rath has been reversing cardiovascular disease for years, and it is our hope that all who have access to this information will put it to use, because it works, it can save your life, and we can wipe out cardiovascular disease in our lifetime. Early studies showed that using eggs caused a rise in cholesterol levels. Those studies used dehydrated eggs. Dehydrated eggs contain oxidized fats that attack your arteries; hence the body’s need for cholesterol rises. Early studies on coconut oil showed that cholesterol levels rose after its consumption. Those studies used partially hydrogenated coconut oil. Regular coconut oil is actually good for you, and contains many healthful benefits. Partially hydrogenated oils attack your arteries and raise your need for cholesterol (to repair the damage). When we mention a supplement, herb, or food that lowers cholesterol levels, know that it is first lowering your need for cholesterol. End of story. Don’t worry about your cholesterol levels, but rather look at your diet and lifestyle that cause a need for high cholesterol levels. So far, you should have learned to avoid partially hydrogenated oils and oxidized fats (found in ALL packaged bakery goods). If you want to bake, learn to do it all from scratch with fresh ingredients. Packaged cake mixes, brownie mixes, and the like will raise your homocysteine levels, which attack your arteries causing your cholesterol levels to rise. Now, considering that oxidized fats (cholesterol is just one form of fat) lead to heart disease, avoiding oxidized (rancid) fats (and partially hydrogenated fats, that aren’t rancid, but just are not meant for human consumption) is one way of protecting our arteries. However, even the cholesterol that we need in our bodies, and we do need cholesterol, can oxidize due to toxins from our air, water, and food. So how do we keep that from happening? Antioxidants are one way. Linus Pauling (in a report co-authored with Dr Rath) discovered a connection between lack of vitamin C and atherosclerosis. He called atherosclerosis a pre-scurvy condition. The article/chapter on Arteriosclerosis (Atherosclerosis) will tell you the rest of this story. Your basic antioxidants are vitamins C, E, A, Beta-Carotene (all the carotenoids), and selenium. “Let your food be your medicine,” is our guideline, but at times we must supplement. Getting megadoses of vitamin C is nearly impossible through diet alone, and vitamin E, in the amounts most naturopaths are currently recommending is just as difficult to obtain from food. Find a good company that makes vitamin E from whole organic foods. Vitamin E (1,200 IU daily) stops the oxidation of LDL by as much as 175% according to Dr David G Williams [Alternatives 5:9, March 1994]. Olive oil contains oleuropein and DPHE, two compounds that completely stop the oxidation of LDL cholesterol. Beware of overly processed olive oil. It contains none of these compounds. Buy only extra virgin or virgin olive oils. Countries with diets high in Alpha-Linolenic acid (LNA) have the lowest incidence of heart disease. LNAs keep your cholesterol from oxidizing (becoming rancid). Seeds and nuts are your best source of LNA. The Archives of Internal Medicine [92;152(7):1416-24] found that those who ate nuts five times or more a week reduced their risk of heart disease by 50%. Those who ate nuts just once a week lowered theirs 25%. The benefits of flax are widely known because of Germany’s Dr Johanna Budwig who has helped to heal everything from cancer, to heart disease, to ADHD and ADD. (Not to mention diabetes, arthritis, and acne). Flax is an essential fatty acid (EFA). We need EFAs in our diets. Salmon, mackerel, albacore, and regular tuna are good sources too. 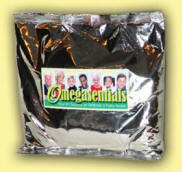 Omegasentials are the best form of EFAs we've ever discovered, period. Hemp oil is very high in LNA. Many companies are now selling hemp oil and denatured hemp seeds. Check with the company to find out how they denature their hemp seeds. Pumpkin seeds are great too, and besides containing LNA, they contain zinc, phosphorus, and magnesium. They have been known as the poor man’s remedy for prostate enlargement. Soy products, besides decreasing the risk of breast, colon, and oral cancers, are high in LNAs. Because of information on soy (discussed further on) we’ve uncovered, we recommend eating only fermented soy products. Quercetin, a bioflavonoid, reduces the oxidation of cholesterol. It can be taken as a supplement (50 to 150 mg/day), but should be taken with vitamin C (to boost its effect) and copper (with which it binds to cut the destruction of vitamin C). Quercetin is found in the pulp portion of citrus fruit, onions, apples (skin), broccoli, shallots and summer squash.